The food was good. The service in the restaurants at dinner takes at least 2 hrs. The coffee shop needs to open earlier as 8 am is to late for the coffee shop to open. If not better coffee cups need to be available to take to the rooms. Variety of restaurant choices excellent. Pools and bar locations also very convenient, Never struggled to find a drink. People were great. Found staff extremely polite, courteous and even entertaining at times. Negative: (maybe not) whats with the Ginormous sandbags on the beach? Frankly really reaching to list a negative. Great Place will not regret. The beach is a little small. Pools are awesome. Staff are all great. Prepare to be pressured by locals selling things and excursions on the beach. Food was good, but is often only warm at its hottest, even in the higher end restaurants. Bars are great. Coffee is super. “Casino” is not even worth visiting. I liked the atmosphere of the exotic birds and the many activities/excursions you could participate in. Biggest issue was the number of people constantly hounding you to join their H10 program and/or upgrade you package. Also lots of people solisticing excursions and products. Vendors that were brought on for certain nights just harassed you to buy their items and to look at them even when they were told no interested. Overall resort was nice, food was good and drinks were great. We did have an issue with not getting the type of room that we requested but that did get fixed the following day. Not much shade if you want to be by the pool but the beach area was much better. Would we go back? Not to this resort as we had much better overall satisfaction with a sister resort for another location. This was our 4th straight year going to ocean blue. We have previously stayed at large resorts but love the way ocean blue is set up. The staff is very friendly & work very hard. We’ll be back again! We would have liked our group of 9 to at least be in the same building, but that didn't happen. The hotel and grounds are very nice. Food was really good. Waiters in restaurants were great. Not sure why I wasn't asked about our flight home. We were very disappointed that Orbitz didn't contact us regarding our flight being changed. Instead of flying to Houston at 5:00 PM, we had to fly to Newark at 1:30 PM. We spent our whole last day of vacation flying. All the staff was outgoing and super fun. The pool is really big and right next to the ocean. One thing is that they don’t give you a blankets in the room. We asked the first day and never got one. Beautiful resort! Lots of activities and resort staff very helpful and friendly. The resort is beautiful and has great food, but the service is very disappointing. Problems are never resolved and valuable vacation time is just wasted. I waited three hours to have my Room available with two small children crying. It was an eternity. Then the power kept going out in my room and took two days to resolve. Not a good experience at all sorry to say. 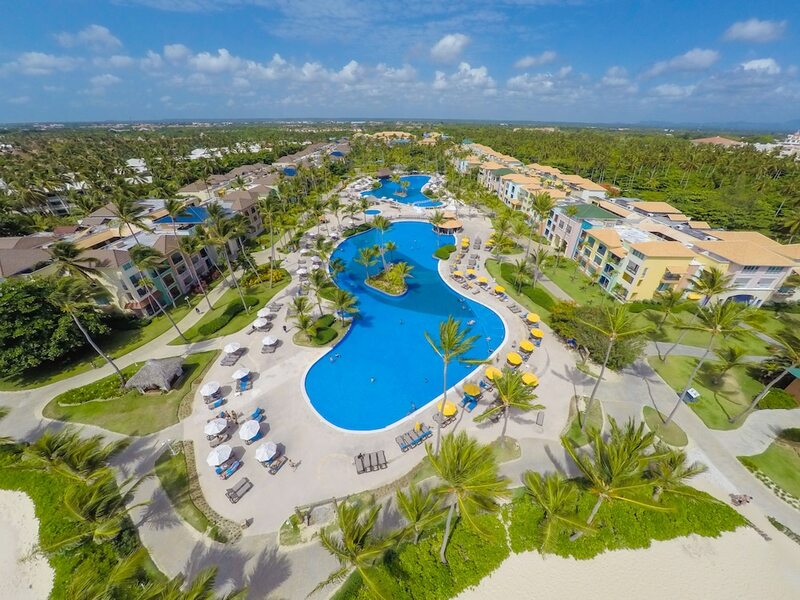 Ocean Blue & Sand Beach Resort - All Inclusive places you within 3 miles (5 km) of popular attractions like Cortecito Beach and Iberostar Golf Course. This 708-room, 4-star property welcomes business and leisure travelers with a private beach, a full-service spa, and a casino. Start your day off right with a free buffet breakfast, served each morning from 9 AM to noon. Enjoy dining at El Carey, one of 7 onsite restaurants. Order from room service to satisfy your hunger without leaving your room, get a quick pick-me-up at the coffee shop/café, and mingle with other guests at the free daily manager's reception. Guests can expect to find free WiFi and 32-inch an LCD TV with cable channels. Beds are dressed in down comforters and the bathroom offers a jetted tub, a hair dryer, and free toiletries. Other standard amenities include private spa tub, a balcony, and a sitting area. Ocean Blue & Sand Beach Resort - All Inclusive features a private beach, a full-service spa, and a casino. If you plan to drive, free parking is available. The front desk has multilingual staff on hand 24/7 to help with luggage storage, dry cleaning/laundry, and securing valuables. Other amenities at this all-inclusive property include a nightclub, an outdoor pool, and a children's pool. Dear guest. On behalf of Hotel OBS I apologize for the inconveniences during your stay Regards. Marisa Rios. Dear guest. On behalf of Hotel OBS I would like to tank you and say that your feedback helps us improve our level of service with particular emphasis on these areas of opportunity you mentioned in your valuable comments. Kind regards. Dear guest. Your feedback helps us improve our level of service with particular emphasis on these areas of opportunity you mentioned in your valuable comments. Kind regards. Dear Guest, Receive our most cordial greetings, On behalf of Ocean Blue and Sand staff, we thank you for have chosen our hotel as your holiday destination. We would like to thank you for contributing with this comment, which expresses the wonderful experience you had during your stay among us. It pleases us to know that our staff was able to reach your expectations by delivering a personalized service. Rest assured, we will be sharing your nice comments with them. We thank you again and will be expecting you in the near future. Best regards, Marisa Rios. Dear guest. From the Ocean Blue & Sand, we reiterate sincerely and while we welcome your feedback on your stay. It is always a pleasure to receive feedback from our guests as they help us to continue our philosophy of service and continuous improvement. Your feedback helps us improve our level of service with particular emphasis on these areas of opportunity you mentioned in your valuable comments. Kind regards. Dear Guest, We would like to thank you for sharing your opinion about your stay at Ocean Blue & Sand by H10 We are pleased to know that you and your family had a good time among us and that we were able to reach your expectations by making your holidays an unforgettable experience. Your comments encourage us to continue providing that special touch who defines Ocean hotels It is our pleasure to serve you. Sincerely, Marisa Rios. Free buffet breakfast is served daily from 9 AM to noon. Guests can enjoy a free manager's reception daily. El Carey - Restaurant and bar serving breakfast, lunch, and dinner. Open daily. Margarita - Theme restaurant and bar specializing in Mexican cuisine and serving dinner. Blue Moon - Fine-dining restaurant and bar specializing in international cuisine and serving dinner. I Mascheratti Di Venezia - Theme restaurant and bar specializing in Italian cuisine and serving dinner. Route 66 - Restaurant and bar specializing in American cuisine and serving dinner. Ocean Blue & Sand Beach Resort - All Inclusive features a private beach, an outdoor tennis court, and complimentary bicycles. The property has an outdoor pool and a children's pool. A sauna and a fitness center are other recreation options. The preferred airport is Punta Cana (PUJ-Punta Cana Intl. ): 27-min drive, 16.3 mi/26.2 km.